The best thing about sports is that it provides the forum for great athletes, and even better people, to provide stories that just make you say, ‘Wow.’ Baseball especially has seen outstanding players have circumstances, often beyond their control, derail their career and force them to find a way to get back on track. In 2015 no story has been a better one than that of Rich Hill. It has been fun to watch from the stands or read about in the newspapers and online, but to see it from the field and be a part of it in the clubhouse has been something even better. Hill has been through a lot in his professional baseball career that has spanned 14 seasons. He’s played with six different teams at the Major League level and countless more in the minor leagues. The left-hander has suffered several injuries, including a back injury with the Cubs in 2009 and a torn UCL that required Tommy John surgery in June of 2011. He also dealt with the heartbreak of losing his newborn son, Brooks, in early 2014 after he was born with “multiple health issues,” according to Hill. Throw all of that on top of him being transitioned from a starter to a reliever after 2009 and being released by the Washington Nationals despite posting strong numbers (2-2, 2.95 ERA) at Triple-A Syracuse, and it was clear Hill was looking for a way to turn his career around. That’s when the Ducks came calling. Long Island was looking for a starting pitcher to join their rotation, and Hill had previous success in that role across multiple levels, including the Major Leagues. He took advantage of the opportunity presented, even if it was not with an affiliated ballclub, to try and reinvent himself and showcase his talent to the 30 big league teams. That opportunity ended up changing his career. His strong repetition skills resulted in two marvelous starts with the Ducks where he combined for 11 scoreless innings and 21 strikeouts. The Red Sox immediately took notice and signed him to add some pitching depth. Five starts later, after going 3-2 with a 2.78 ERA at Triple-A Pawtucket, Boston was looking to add a sixth starter to their rotation for September. No one’s name came up in the discussion more than Hill’s, and he was promoted to the big league club on September 8. Since his promotion, Hill has made four quality starts. In his first three, he compiled a 2-0 record with a 1.17 ERA and struck out 30 batters in 23 innings. While he managed only six strikeouts in six innings in his fourth start on Thursday, he was still very effective. The southpaw’s only hiccup came in the second during a steady rainfall in the Bronx. He allowed a solo homer to Carlos Beltran on a fly ball that probably leaves no other ballpark but Yankee Stadium and then walked two hitters before allowing a two-out RBI single to fall into a 2-0 hole. However, from that point on Hill yielded only two more hits and a walk and finished his night by striking out the side of Alex Rodriguez, Carlos Beltran and Chris Young in the sixth inning. As for what enabled him to finish so strongly, his manager stated “He just got into a better rhythm. He wasn’t walking around the mound after every pitch. He got more into getting the ball back from the catcher, stepping right back up onto the mound and making his pitch…You could see that it played out very well for him because things really settled down after that second inning. Unfortunately for the former Duck, his teammates were stifled by a combination of C.C. Sabathia, Adam Warren and Dellin Betances. The trio of Yankees held the Red Sox to just one run and seven hits in New York’s 4-1 win that was the 10,000th in franchise history and clinched a playoff berth. For Hill, it meant a hard luck loss, his first since joining Boston this season. Although he was understandably down after his team dropped the series finale, Hill was pleased with the results from Thursday and all four of his starts. CLICK HERE to view photos taken by the Ducks during Hill’s start. Not only have Hill and his manager been pleased with the results, but his teammates and opponents have clearly taken notice. From everyone that you talk to, whether they are youngsters making their first mark in the Majors or veterans who have been there for years, his story has captivated the entire organization. Not only that, but it has given a team without a playoff berth a burst of energy to the tune of a 13-9 record since his call-up, including wins in six of their last seven games. As for the younger players in the clubhouse, Hill provides a veteran presence that is full of knowledge and experience. While he tries to establish himself back in the big leagues, others seek out his advice to find ways to be successful at the game’s highest level. Rich’s story is not one-of-a-kind though in the Red Sox clubhouse. Craig Breslow, a 35-year-old right-handed pitcher, joined the New Jersey Jackals of the independent Northeast League in 2004 after being released by the Milwaukee Brewers. After going 3-1 with a 4.10 ERA, he was signed by the San Diego Padres in March of 2005. He has gone on to spend 10 seasons in the Major Leagues, including five with Boston, and won a World Series ring in 2013. That opportunity might have never come around without independent baseball. 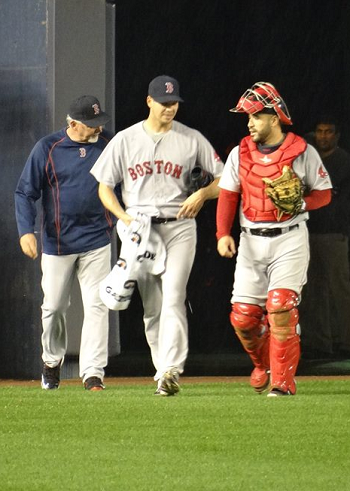 Many, including Lovullo, Pedroia and Porcello, noted the story of Daniel Nava. The 32-year-old outfielder went undrafted out of college and needed a place to continue playing baseball. He ultimately signed with the Chico Outlaws of the independent Golden Baseball League in 2007. After batting .371 there with 12 homers and 59 RBI in 72 games, the Red Sox signed Nava in January of 2008. Since then, he’s gone on to spend parts of five seasons in the big leagues, all with the Red Sox until the Tampa Bay Rays claimed him off of waivers from Boston this past August. While he may no longer be with the Red Sox, his story still radiates within their clubhouse. Hill’s story is vastly different though because of his journey to the Atlantic League coming at the age of 35 and after he spent a long time in the Major Leagues. When he joined the Ducks in late July, he was unsure of what to expect in terms of the talent and the fan base. What he ended up seeing blew him away completely. No matter how the remainder of his story is written, the most recent chapter has been one heck of a read. It has showcased why the Ducks, the Atlantic League and independent baseball as a whole are so beneficial to Major League Baseball. It has given an outstanding pitcher, and an even better man, the opportunity to resurrect his career and add special memories to his life. Rich Hill’s journey from the Major Leagues to the Ducks and back again is one that will go down in the history books as one of the most inspirational and meaningful that professional baseball has ever seen. Michael Polak is the Director of Media Relations and Broadcasting with the Long Island Ducks. He has spent each of the past six seasons with the organization and is the point person responsible for the Ducks game broadcasts, all media requests, website operations, publicity and communications. He was in attendance at the Red Sox vs. Yankees game where Hill start on October 1, 2015.